We normally park by the river, but the access lane is quite close to the river. After the heavy rain over the previous week or so, we decided it would be more sensible to park at Bewdley and travel by train to Arley. On the 22nd November the water level was just across the lane, but a week later the level was much higher, as the photos will show. 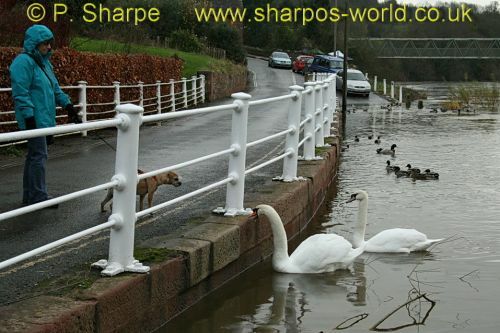 This entry was posted in Sharpo's World Photo Updates on November 30, 2009 by Sharpo. Last “normal” day before Santa operations begin next weekend. 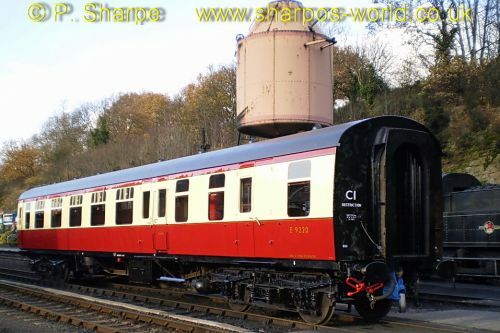 Didn’t photograph 5164 which hauled us to Arley, as it was bunker-first. At Arley the other two trains crossed, the bonus being D8188, which will be a spare loco in case of problems when the Santa trains run. 6024 was seen in steam at Bewdley and a couple of photos inside an LNER coach complete the photos from the day. We had a walk into Bewdley to see how high the River Severn was. The flood barriers had been erected as a precaution, but at the time of our visit they did not seem to be needed – better safe than sorry! I can remember very high levels a few years ago, with many houses alongside the river flooded, hopefully the barriers will prevent this from happening in future years. Update 235. 60040 on 6E41 at Kings Norton, also 66140 & 66058. After seeing the Class 31 at Dorridge, I headed to Kings Norton to see 97301 return to Derby, unfortunately it had run early & I missed it. 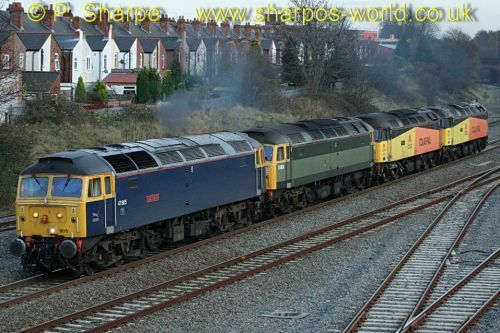 Still, 60040 on 6E41 was worth seeing, and also a late running steel train, closely followed by the banking engine. Some sunlight would have been nice, but…… never mind! This entry was posted in Sharpo's World Photo Updates on November 29, 2009 by Sharpo. KC was with us today, we caught the 12.15 from Bewdley, hauled by 5164. This crossed with 7812 at Arley. After our sandwiches, it started raining just as we walked down towards the river, which was higher than last weekend. We didn’t hang round for long before heading back to the comfort of the waiting room. The train back to Bewdley was hauled by 5764. D8188 is now at Arley as a spare loco in case of failure during the Santa period, good idea!! 6024 in steam at Bewdley, ready for departure in a day or two. 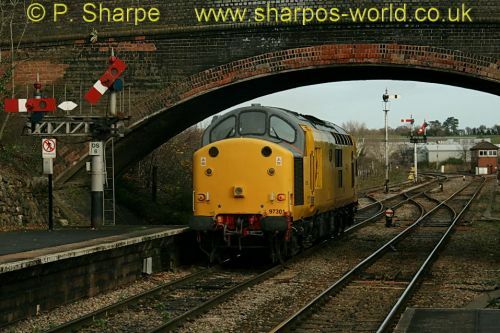 This entry was posted in Severn Valley Railway on November 29, 2009 by Sharpo. We wanted some lunch at Highley today, so no KC with us, probably a good job as our 12.15 train from Bewdley was delayed. Not sure exactly what the problem was, something to do with signalling problems I believe, but we had to wait for the Bridgnorth train to reach Bewdley before we could leave. 46443 was on our train, 7812 on the train from Bridgnorth. After lunch at the Engine House, 5764 took us back to Bewdley. D8188 was at Bewdley when we started our journey, but at Arley on our return, at least it wasn’t performing “thunderbird” duties! 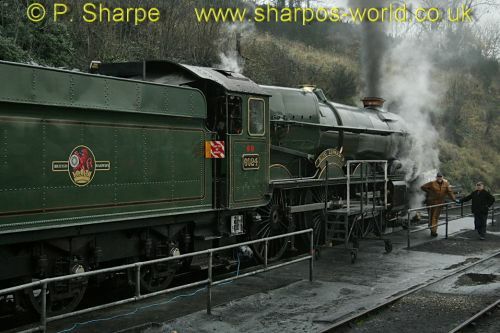 This entry was posted in Severn Valley Railway on November 28, 2009 by Sharpo. The timings for the train indicated that it would stop here for about an hour, so I decided on a shot from the platform as it passed by on the loop. As it approached I realised it was still on the main, but approaching very slowly. The going away shot explains the reason for slowing – a local DMU, seen in the distance, had been crossing the down line. And the usual photo included here….. This entry was posted in Sharpo's World Photo Updates on November 28, 2009 by Sharpo. Fresh from a repaint & looking very smart. Only one photo, at least the link above will get you to the larger photo. Not the usual quality, taken with a cheap compact camera. 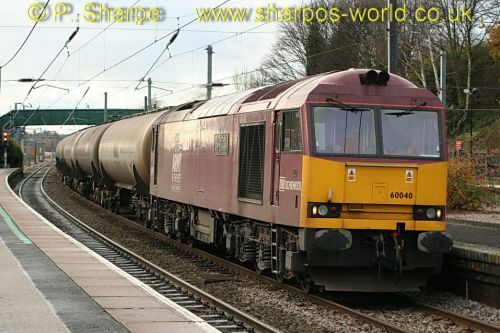 After seeing 97301 at Droitwich I went home for lunch, expecting to have a quiet afternoon, but checking e-mails there was mention of these 47s heading for Rugby via Tyseley. I had 20 minutes to get myself ready, let KC have a quick “visit” to the garden and rush off to the station to catch a train to Tyseley….. It was 15.35 and very dull, but iso1600 gave reasonable results. This entry was posted in Sharpo's World Photo Updates on November 27, 2009 by Sharpo. 97301 was being used on training runs between Worcester & Bromsgrove on several days this week. It was rumoured that drivers were being trained for banking duties, only time will tell if that was true. 66098 also seen on a Round Oak to Margam train. This entry was posted in Sharpo's World Photo Updates on November 26, 2009 by Sharpo. Whilst at Bewdley at the weekend, I was told the 08 was at Kidderminster. As I was going to be in that area today it seemed to be a good idea to get some photos – you never know how long it will stay in one piece! 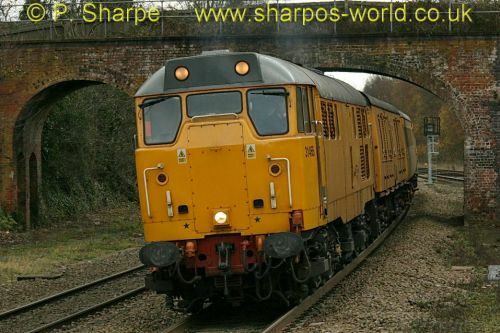 This entry was posted in Sharpo's World Photo Updates on November 23, 2009 by Sharpo. I only took my camera just in case I saw something worthwhile. 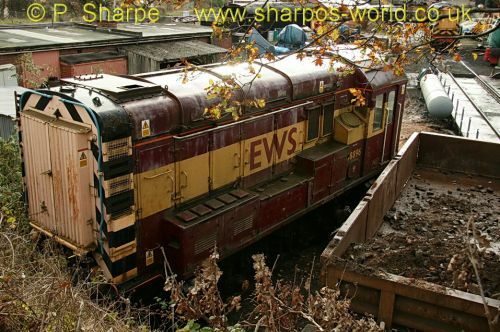 It turned out there was something of interest, D8188 was towed to Bridgnorth at the rear of a service train behind 7812, to replace 42968 which was having problems – it had been very off-beat and was obviously struggling with a 9 coach train. You will note the “Thunderbird 1” headboard on the Class 20! Even the snowman was smiling!!!!! 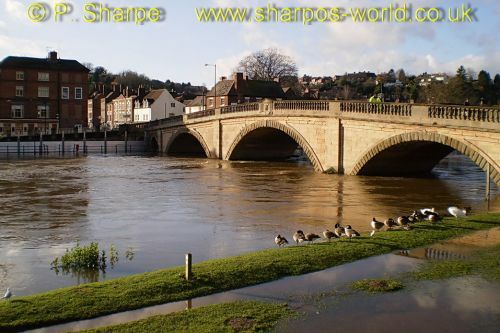 This entry was posted in Sharpo's World Photo Updates on November 22, 2009 by Sharpo.